I heard from Julie that you moved to France so i searched you out to wish you all the very best in your new venture. it seems a good move to me you are doing something you enjoy in a great environment. We have just collected our dog from you. He's a very scared dog, having been previously badly abused, so we were pleasantly surprised to see that he has made great friends with you. We are sure he really enjoyed himself playing with the other dogs in the day, and his brand new, cosy kennel was perfect for him at night. Hello, fellow Cozy Cats and Dogs borders, my name is Rouben and I'm a rather attractive shorthaired Fox Terrier (so my owner Bob, tells me). I wanted to write something on this page as a Thank you, Thank you and a recommendation to others, for the two very enjoyable occasions, I've stayed with Linda and Phill. During both my stays I've made lots of new chums, which, given that I'm a very friendly, sociable, fun loving dog, it suits me just fine to go and stay at CC&SDs. The quality of other borders on both occasions I've stayed has been excellent and I personally have had a wonderful time and don't miss my Bob (owner person) at all.... In fact as a little tease to him when he is away, I get Linda to email him a picture of me enjoying myself with my new chums – well, I wouldn't want him thinking he is the centre of my universe ALL the time and that I just mope in the corner, because at CC&Ds I certainly don't. So, any of you other Cats or Dogs reading my message here, who haven't had a vacation at CC&D, tell your owners to go away somewhere, as you want to try it out.... it's great. I am so delighted that Linda and Phil are here, they have looked after Eddie (my very like to think he is the Boss Jack Russel). I can leave him in their care without a worry. He is so happy staying there and they really care for him. They have a great approach and understanding of the animals in their care. 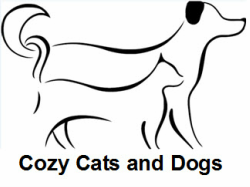 If you have to leave your cat or dog dont hesitate to take them to cozy cats and dogs. They really couldnt be in better hands than with Linda and Phil. Our lively Red setter, Hugo, throughly enjoys his stays at Cozy Cats where he knows that he will be well looked after by Linda & Phil, seems to get plenty of excercise, and have a cosy bed for the night. We never have to worry about how he is, because Phil and Linda email us photographs of him enjoying himself running around the garden. Good Luck with your kennels and cattery and your new home in France! Our pets are very precious to us and it is wonderful when people such as yourselves look after them so well. Had to click on the picture, as spotted the Flat-coated retriever, we have two of our own :) We have found some fantastic kennels near to our home, as you are a bit too far from us, but wish you the best of luck with your own venture. Darcy had a great stay. The daily photos meant we did not have to worry about how she was getting on and Linda even took Darcy to the vet for her treatment pre her return to the UK. A very professional set up that we heartily recommend. We are so pleased to have found Cosy Cats and Dogs after looking far and wide. Linda and Phil are very welcoming and knowledgeable, and run a very professional kennels. They were fantastic with our two german shepherds, one with 'special needs', and nothing was ever too much trouble. Our dogs were very happy in their warm, spacious kennel and with all the care and attention they got. Markus Muhler, the dog food they recommend and supply, is so much better than anything we have tried before and has turned our two dogs around. They kept us up to date with emails and photos and we can highly recommend them. Thanks Phil and Linda. Hi Linda and Phil, just wanted to update you on the 'food' situation. We tried Molly on the new food immediately after leaving you two weeks ago. We mixed it in with her normal food and she ate the new food and chucked the rest on the floor !After 4 days, we didnt bother to add her normal food into the mix and she has continued to eat very well her new food. When we moved here 3 years ago we gradually noticed that she would be quite 'smelly' and put this down to being outside more and getting older...until she went onto the new food and after two days, we both commented that she does not smell at all ! She seems calmer, her coat is becoming more shiny and above all, she is eating all her food without hesitation or 'extras'. I did not want to contact you earlier because I know that she can be fickle and change her mind at the drop of a hat but, I can honestly say that she has 'never' eaten as well! When we picked them up to reunite them with our mum, we were immediately struck by the fact that they were much more relaxed than usual....back in their home environment we now find ourselves with two happy well-behaving and healthy looking boys, responding when we call them and much more attentive and easygoing than before their stay.